For the first time, researchers have measured what is known as the ground effect of flying animals—and it turns out that they save a lot more energy by flying close to the ground than previously believed. The study from Lund University in Sweden supports one of the theories on how birds began to fly. "Our measurements show that the ground effect saves animals twice as much energy as models have suggested. ", says Christoffer Johansson, biologist at Lund University. For the first time, Christoffer Johansson, together with colleagues Anders Hedenström at Lund University and Lasse Jakobsen at the University of Southern Denmark, have successfully managed to measure the ground effect when Daubenton's bats fly in a wind tunnel. In short, the ground effect means that a surface, ground or water, acts as an aerodynamic mirror that increases the air pressure under the wings—it costs less to generate lift. The ground effect is achieved within one wingspan of the surface, and the effect decreases exponentially with distance to the surface. An even surface, e.g. a calm lake where bats and birds catch insects or drink while they fly, provides optimal conditions. The new study also shows that animals use even less energy if they flap their wings rather than gliding near the ground. 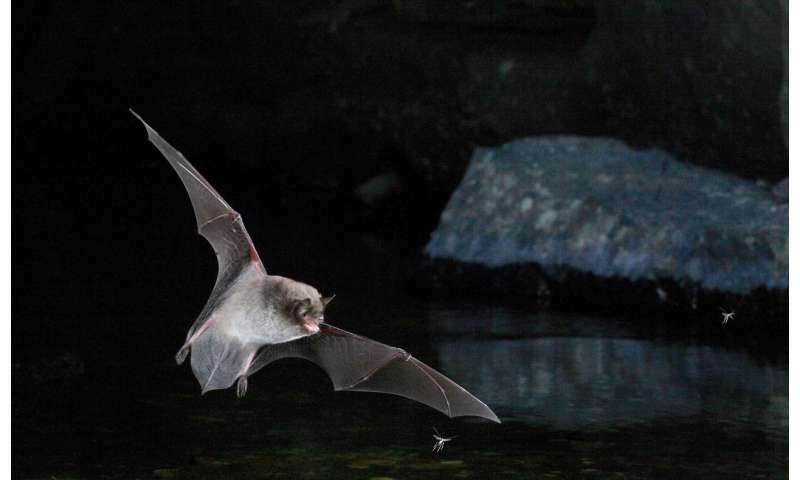 Although the study was performed on bats, it has implications for birds and insects. One theory of how animals developed the art of flying is that they threw themselves between branches and trees. Another theory is that flying began on the ground. By running and jumping, proto-wings could have allowed the animals to run faster and jump higher and eventually flight evolved, a theory commonly known as the "ground up" theory. The corresponding theory behind today's flying insects is that they moved on the water surface and eventually evolved wings as a means of propelling themselves across the surface. "This is obviously speculation, but if flapping animals save more energy than we previously believed by flying close to the ground, then the ground up theory becomes more probable, i.e. that the animals began to fly by first running and jumping on the ground with flapping precursors to wings. ", says Christoffer Johansson. The results are published in the journal Current Biology.